I have always been curious to open up an old hard drive and look at the inner workings. This was always difficult because of the thick plated steel that protects the moving arm and platter, and the thick bolts with unique socket shapes (Hexalobular screws possibly). My handy father recently cracked one open with some persistence. This is what the inside moving arm and magnetic spinning platter looks like. It is a 4 Gb Western Digital circa ~2003. After playing with the pieces I was eager to see one in action. Not to be out done, good old Wikipedia has an excellent article on hard drives including a small video of the inside of a hard drive in action: http://en.wikipedia.org/wiki/Hard_disk_drive. 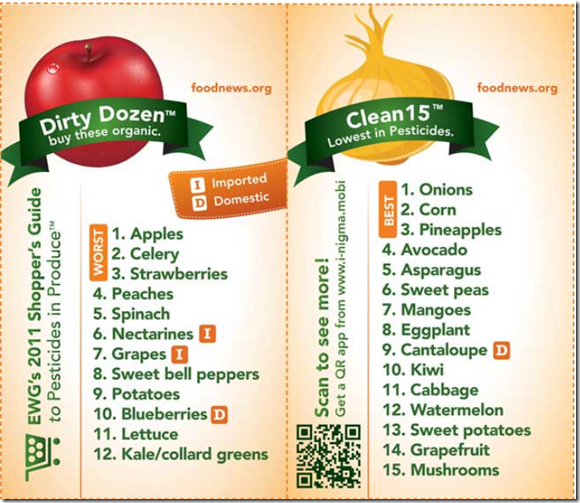 The Environmental Working Group (EWG) recently published an easy-to-read list of which fruit and vegetables are the worst and the best for pesticide exposure. You can read more about it here: http://www.ewg.org/foodnews/. Need to do an external DNS lookup, ping, WHOIS, reverse lookup? There are many online sites that provide these services. One that is relatively simple and streamlined is ping.eu: http://ping.eu. intoDNS: IntoDNS checks the health and configuration and provides DNS report and mail servers report. ipTools.com: Find Ip Tools, DNS tools, internet tools, WHOIS, traceroute, ping, domain name tools and more. mxToolbox.com: Will list MX records for a domain in priority order. The MX lookup is done directly against the domain’s authoritative name server, so changes to MX Records should show up instantly. I stumbled accross an excellent article release by the Mayo Clinic article on ‘Tips for cultivating contentment‘ (http://www.mayoclinic.com/health/how-to-be-happy/MY01357). Some great advice in here. Do you know how to be happy? Or are you waiting for happiness to find you? Despite what the fairy tales depict, happiness doesn’t appear by magic. It’s not even something that happens to you. It’s something you can cultivate. So, what are you waiting for? Start discovering how to be happy. Only 10 percent or so of the variation in people’s reports of happiness can be explained by differences in their circumstances. The bulk of what determines happiness is your personality and — more modifiable — your thoughts and behaviors. So, yes, you can learn how to be happy — or at least happier. The good news is that your choices, thoughts and actions can influence your level of happiness. It’s not as easy as flipping a switch, but you can turn up your happiness level. Here’s how to get started on the path to creating a happier you. Friends and family help you celebrate life’s successes and support you in difficult times. Although it’s easy to take friends and family for granted, these relationships need nurturing. Build up your emotional account with kind words and actions. Be careful and gracious with critique. Let people know that you appreciate what they do for you or even just that you’re glad they’re part of your life. Make a commitment to practice gratitude. Each day identify at least one thing that enriches your life. When you find yourself thinking an ungrateful thought, try substituting a grateful one. For example, replace “my sister forgot my birthday” with “my sister has always been there for me in tough times.” Let gratitude be the last thought before you go off to sleep. Let gratitude also be your first thought when you wake up in the morning. Develop the habit of seeing the positive side of things. You needn’t become a Pollyanna — after all, bad things do happen, and it would be silly to pretend otherwise. But you don’t have to let the negatives color your whole outlook on life. Remember that what is right about you almost always trumps what is wrong about you. People who strive to meet a goal or fulfill a mission — whether it’s growing a garden, caring for children or finding one’s spirituality — are happier than those who don’t have such aspirations. Having a goal provides a sense of purpose, bolsters self-esteem and brings people together. What your goal is doesn’t matter as much as whether the process of working toward it is meaningful to you. Try to align your daily activities with the long-term meaning and purpose of your life. Research studies suggest that relationships provide the strongest meaning and purpose to your life. So cultivate meaningful relationships. Don’t postpone joy waiting for a day when your life is less busy or less stressful. That day may never come. Instead, look for opportunities to savor the small pleasures of everyday life. Focus on the positives in the present moment. Don’t spend your time rehashing the past or worrying about the future. Take time to stop and smell the flowers. Launch “msinfo32.exe” from the command line or Run Window. This utility provides a nice detailed report about your computer’s hardware configuration, computer components, and software, including drive drivers. You can export the results to a file. Launch “msconfig.exe” from the command line or Run Window. From this utility you can control how your system start’s up including the O/S boot order and which device drivers are loaded. There is also a very handy Tools tab that lists other system tools. You pick any took and directly launch into it. If you have ever used Microsoft Office to author a document, and then saved it as HTML, you know that the HTML document is littered with large amounts of Microsoft Office-specific tags , including tags used by Microsoft Word to format the document. This is good if you plan to keep editing the document in Microsoft Office, but not so good if you plan to post the resulting HTML file on a Web page or edit it with another HTML formatting editor. Microsoft Word 2010 has a file format that you save your document to called “Web Page, Filtered”. This will remove the Office specific tags and only keep the formatting tags necessary to render your document in HTML – as it appears in Word. Note: saving in this format might prevent you from using some Office features in this document if you edit it in Microsoft Office at a later date. It is a quick and easy way to clean up the resulting HTML of your Word document though. Microsoft LightSwitch is a great technology from Microsoft to build business applications. It leverages Silverlight under the covers and is a simple way to design and delivery polished business applications that consume information from a variety of data sources.